The close of King George's War in 1748 left no one satisfied. In America, the two parties agreed to pull back to their borders that existed before the war. This frustrated New Englanders who had sacrificed a great deal to make small gains on the New England Canada border. More frustrating was the fact that the disputed territories in the Ohio Valley remained disputed. A committee was supposed to make final border decisions in that area, but it never did. Both France and England claimed that territory. The best way to secure a claim is to plant colonists on it and have them remain loyal to your country. However, the Iroquois-controlled tribes living on that land did not want colonists from either side living there. Moving in colonists too aggressively would simply cause the Indians to rise up and kill them and probably align themselves with the other country for future protection. Over the prior decade, Indian tribes from Pennsylvania that had been forced to move west into the Ohio Valley had brought with them English traders. These were men who bought their furs and other goods and provided them with metal tools and other European goods that they could not manufacture themselves. So by the late 1740s, English trading posts dotted the territory with support from local tribes. Concerned about these English encroachments, the French sent 200 Frenchmen and 30 Indians on a trip around the Great Lakes and through Ohio country in 1749. The purpose was to renew French claims to the region, to gather intelligence on English presence in the area, and to impress upon the Indian populations that they remained under the French sphere of influence. Capt. Pierre-Joseph de Céloronn de Blainville led the expedition. The French were disturbed by the number of English traders they found on what they considered their territory. However, they were not ready to start a war over the matter yet. They simply told the traders that they were trespassing on French territory and ordered them to leave they also ordered the local tribes to cease and desist trading with the English within their territory. In most cases, the English and the Indians simply ignored the orders, although they did report the incidents to colonial governments in Pennsylvania, Maryland, and Virginia. The French even buried lead plates at certain areas as a way of proving that they had been there, and that the land belonged to France. For the English colonists, moving into the Ohio Valley, as long as they could convince the local tribes to approve it, was their best method for laying claim to the land. About the same time that the French Capt. Céloron was telling the English to “get off my lawn” and burying lead plates, King George II granted several new charters for Virginia colonists to claim land in the Ohio Valley and other western lands. The King’s offer of free land was not without strings. The Investors had to make agreements with the local tribes, settle at least 100 families, build a fort, and provide the necessary defenses and supplies to ensure the success of the venture. All of this would cost money. About two dozen investors, including wealthy Virginia Planters and a few London investors, formed a partnership called the Ohio Company of Virginia. The king had granted about 200,000 acres of land in the Ohio Valley with another three hundred thousand if they could successfully settle 100 families within 7 years. Among the investors was Thomas Lee, Colonial governor of Virginia. Actually, the title he used himself was President of Virginia. Also among the original investors were Lawrence and Augustine Washington. In addition to money, it was important the Company had political influence. The Colony would almost certainly have to provide military assistance and also promote policies that would encourage immigration into the new territories. Most of the investors were also members of the colony's House of Burgesses. When Governor Lee died suddenly in 1751. the astute investors quickly included the new Governor, Robert Dinwiddie to the group. Investor Lawrence Washington died in 1752. His younger half-brother George inherited some of his properties and also joined the company as a partner. The Ohio Company established a “strong house” at Wills Creek, near modern day Cumberland Maryland, to be a launching point for expeditions into the Ohio Valley. It was not big enough to be a fort. Rather, it was a defensive building strong enough to defend against thieves or small raiding parties. The company could store supplies there for use on expeditions. 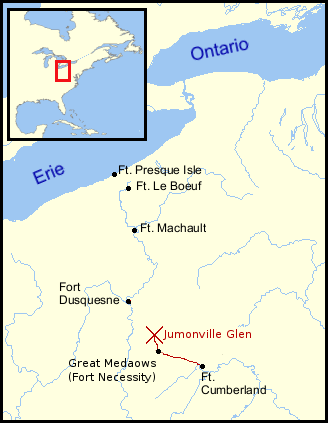 "Jumonville Glen" where fighting took place. In July 1752, around the same time the Ohio Company was building its staging area at Wills Creek, the Marquis Duquesne de Meneval, arrived at Quebec as the new Governor General arrived in Canada. He brought with him an aggressive agenda to secure as much land as possible. The French erected a series of small forts, beginning with Fort Presque Isle on the southern shore of Lake Erie, where Erie, Pennsylvania now sits. Fort Le Bouef was built a few miles south on French Creek a tributary leading into the Allegheny River. Several miles further down river, they established Fort Machault. The French also sent a military party of Canadians and Indians to destroy one of the largest English trading posts in the Ohio Valley. While still trying to avoid starting a war by killing English colonists, they had no such compunctions about killing Indians who cooperated with the English. The party ripped the heart out of one Indian trader and ate it. They allegedly boiled and ate another. They destroyed the trading post and took other prisoners back to Detroit. These barbaric acts, meant to shock and awe those who would fail to obey French rule, had their intended effect. The victims, Miami Indians, sought help from Pennsylvania, but the Quaker government refused to get involved in a war. As a result, the Miami secured a peace with the French and agreed to trade only with them. The few colonists from Pennsylvania who had settled among the local tribes fled back east, not waiting until the French decided to turn on them as well. Both the French and the British targeted the location where the Allegheny and Monongahela rivers met to combine into the Ohio River as a key strategic point. Whoever controlled that would control all river traffic in the Ohio Valley. The French Fort Machault was about 75 miles up the Allegheny river. The Ohio Company built another fortified strong house at Redcreek, about 40 miles up the Monongahela River. In late 1753, Virginia and the Ohio Company decided it might be a good idea just to tell the French to leave. They decided to send an emissary with a letter from Virginia Gov. Dinwiddie notifying the French that they were encroaching on British territory and that they should leave before things turned violent. Such a mission called for diplomacy, tact, and experience to ensure the message was delivered without starting a war. One would think the ability to speak French might also be a prerequisite. Why they decided to leave the mission to an inexperienced 21 year old who knew no French has always bothered me. The young man in charge of this mission was one of the youngest partners in the Ohio Company, an up and comer named George Washington. Dinwiddie commissioned Washington a Major in the Virginia militia, despite no military training nor experience. Washington assembled a small team of less than 10 men, some colonists, some Indians, including Jacob Van Braan, a translator who spoke both English and French, Christopher Gist, an agent for the Ohio Company who had already scouted out much of the territory, Tanaghrisson, the Iroquois leader in charge of overseeing the local tribes who were under Iroquois control, and a few others. The expedition made its way through Ohio Valley, traveling down the Monongahela and up the Allegheny to Fort Machault. There, the commander told Washington to take his message further upstream to Fort LeBoeuf. The French Commander at Fort LeBoeuf. Capt. Jacques Legardeur de Saint-Pierre received the party and treated them respectfully. Washington delivered a message from Gov. Dinwiddie demanding the French leave Virginia immediately. Capt. Legardeur provided Major Washington with a written response that essentially said, I’ll pass this along to my higher ups, but this is French territory, and (respectfully) we are not leaving. Both sides were determined not to back down, but neither wanted to be responsible for starting another war. If war was inevitable, both sides wanted to say the other guy started it. Washington returned the note to Gov. Dinwiddie in Williamsburg. He had done more than deliver a letter. Washington took careful notes of French defenses and troop numbers. He also kept an eye out for prime real estate where the Ohio Company might be able to set up villages. Governor Dinwiddie promoted Washington to Lt. Col. and authorized him to raise a force of 200 soldiers to resist French encroachment into the Ohio Valley, which all Virginians believed was clearly just part of Virginia. The Governor also handed out commissions to other Ohio Company members who were building additional strong houses in the Ohio Valley. The next one would be the most controversial, a structure right at the forks of the Allegheny and Monongahela Rivers. The workers began construction in the middle of winter out of a concern that spring would see French ships moving down river to build their own fort. The local tribes were not outright hostile, but had no intention of cooperating with the English. They refused to sell them food, even at inflated prices. The local Delaware, Shawnee, and Mingo well remembered the brutal French murder of Indians who had traded with the English a few years earlier. The French seemed to be the better bet, and picking the wrong side could have fatal consequences. Despite the local pro-French bias, Tanaghrisson, the Iroquois agent in charge of the Ohio Valley tribes was clearly pro-English. His authority came from the Iroquois, who though technically neutral, generally sided with the English. He also told people that the French had killed and eaten his father. Tanaghrisson personally helped build the strong house with the English where the three rivers met. Just about the time they finished the house in April 1754, about 500 French Canadians and allied Indians arrived on the site with about 15 cannon. The small force of about 40 men inside the structure, mostly builders, not soldiers, surrendered to the superior force. The men were treated well and permitted to leave with their possessions. The French decided that a much more imposing fort was needed at the site. The named it Fort Duquesne in honor of the new Governor General of Canada. As the French established Fort Duquesne, Washington had been making his way up to the forks when he received word of the surrender. He had failed to recruit the 200 man regiment, having acquired only 160 men with little training, equipment, or supplies. Most of them had joined with the inducement of receiving land around the forks to start their own farms. Now that it was clear that the land would not be available, most wanted to give up and go home. Gov. Dinwiddie refused to allow the advance to stop. He told Washington the men should be satisfied with their agreed pay of eight pence per day. If that doesn’t sound like much, you would be right. It is about one-third of what a common laborer would make in a far less demanding and dangerous job. The Governor ordered the Regiment to press on. This pathetic 160 man regiment had no hope of retaking the entrenched French force of over 500. Yet Washington was under orders to capture or kill anyone who resisted British settlement of the region. 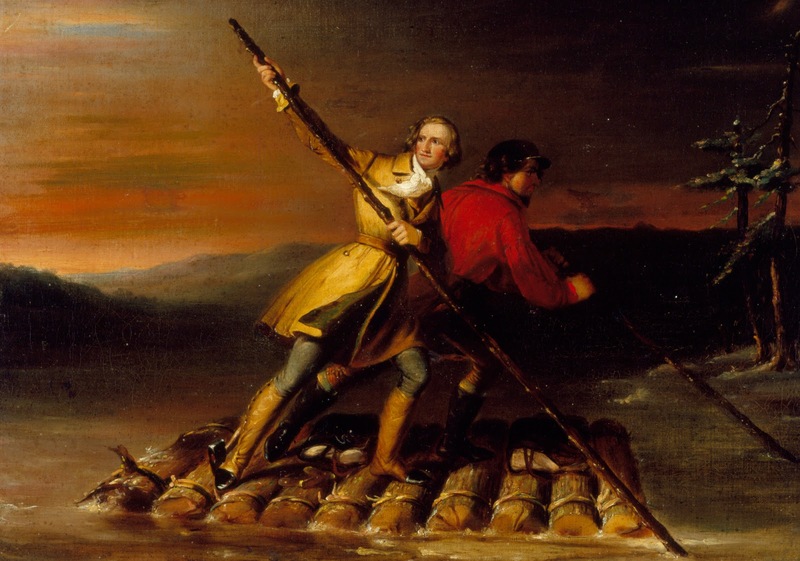 Washington received promises of reinforcements, but had to press ahead until they arrived. The men began cutting their way through the forest, building a trail toward the Red Creek Strong House. They proceeded only 2-3 miles per day, hoping that the reinforcements would catch up with them before they made contact with the enemy. Local Indians informed the French troop busily constructing Fort Duquesne that a force of several hundred British troops was headed in their direction. The commander sent an Ensign named Joseph Coulon de Villiers de Jumonville with a command of 35 soldiers to find the English, gather intelligence and order them to leave French territory. Jumonville was not expected to attack a force of several hundred with his 35 men. Rather, his goal was simply to make first contact, size up the enemy, and report back to the Commander at Fort Duquesne. Washington learned through informants that a French force was only a few miles away to the north. His men were in open country, about half way between the Wills Creek Fort and Fort Red Creek. He sent about half his force, 75 men under Capt. Peter Hogg to move up river and intercept the enemy. That night though, Tanaghrisson, arrived in camp with news that the French were only a few miles away. The intercept force of 75 men had marched off in the wrong direction. Now Washington was in the middle of nowhere, at night, with an enemy force nearby with unknown intentions. Washington and his men approached the French camp near dawn on May 28, 1754. Their Indian allies moved to the other side of the camp to surround the French. French soldiers became alerted to the English presence and began to stir excitedly, going for their guns and getting ready to defend against a surprise attack. A French soldier may have fired a shot in the excitement, but the British fired at least two volleys into the camp, killing or wounding at least a dozen men. Some French tried to flee the camp, only to encounter Tanaghrisson and his Indians in their rear. At some point, the French commander Jumonville was able to call for a ceasefire, after being wounded. He stated that he was there simply to deliver the French message that the British were trespassing and should depart, much like Washington had done at Fort LeBoeuf the prior year. Before he could finish reading the letter, Tanaghrisson grabbed a tomahawk and split open his skull. According to some witness accounts, Tanaghrisson made a comment that he was doing this to avenge his father. At this point the other Indians began killing the French wounded before the British could stop them. The surviving French were returned to Virginia under guard as prisoners. At least one though, escaped to return to Fort Duquesne and report on the massacre. Washington’s official account does not mention that several of those killed, including Ensign Jumonville, were wounded in the battle and executed after the fighting ceased. Washington’s account also says the French fired first. The French report that Washington’s men fired on them while they were in camp and before the French even knew they were there. French and Indian witnesses also say that the British began murdering the wounded after they had surrendered and that their Indian allies had to intervene to stop the killing. English witnesses say the Indian allies began to kill the wounded and that the British had to stop them. Regardless of what actually happened, the French were convinced that the British had massacred their diplomatic party. The British believed that the French had been rightfully prevented from a continued invasion of British territory and that the Indian allies may have gotten a little out of control, as they were often prone to do. Both sides blamed the other for what was well on its way to becoming a real war. After the battle, Washington built a small log palisade nearby which he named Fort Necessity. This was a circular log fence about 50 feet in diameter with a few trenches. Washington, who had never built a fort before and had no engineering education or experience, thought it an adequate defense to repel any force of up to 500 men. Reinforcements finally arrived in June, 200 more militiamen from Virginia and about 100 British Regulars from South Carolina. 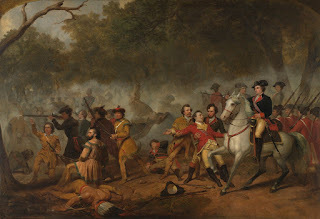 On June 16, 1754, Washington decided to leave the British Regulars at Fort Necessity (since they refused to take orders from a Colonial Militia commander) and press forward with 300 Virginians to take back Fort Duquesne. The reinforcements had brought supplies and arms, including nine swivel guns (small cannon). Washington did not know the size of the force at Fort Duquesne but was determined to defeat it. He also relied on Tanaghrisson to rally local allies from among the Delaware, Shawnee, and Mingo tribes. Not only did the tribes refuse to join, they indicated that they were likely going to help the French. The British were offering nothing but great risk to themselves and their families. If they won, the British would simply begin bringing in colonists that would force the local tribes to give up even more land. They had no inclination to help with any of this. Disheartened, Tanaghrisson not only gave up recruitment efforts, he gathered up his remaining warriors and families and retreated back to the relative safety of central Pennsylvania. Ironically, he would die there, of pneumonia, less than a year later. Without Indian allies, Washington continue to press on, making extremely slow time trying to get the heavy weapons and wagons through the forest. On June 28, still miles from Red Creek Fort, and after receiving word that a large French force had left Fort Duquesne with the purpose of driving all the British out of the Valley, Washington decided to give up his advance and pull back to Fort Necessity. There, at least, he could meet the French in a defensive posture. Most of their horses had died during the difficult advance. Washington’s troops had to drag the wagons and weapons 20 miles back to Fort Necessity over two days. The men were exhausted when they arrived on July 1. The following day it began to rain. The fort was built in a valley which pooled the water, and filled the trenches. There was no roof so only those few soldiers with tents had any shelter. By July 3, only 300 of the 400 soldiers were fit for duty. Most of those who were fit were still wet, hungry, and generally unhappy. At around 11:00 AM the 600 French soldiers and militiamen, along with about 100 Indian allies arrived at the Fort. Their commander was Capt. Louis Coulon de Villiers, half-brother of the deceased Ensign Jumonville. Washington marched his men out of the Fort and lined them up for battle, expecting European style face to face field combat. The French commander though, saw no point to that. He deployed his men behind trees on the hills overlooking the fort and began firing. Washington’s men ran back into the fort where they spent the day hiding from French who fired into the fort from the surrounding hills. The rain had disabled most of the British guns, meaning they could not fire back even if they saw a target. By evening, nearly one-third of the fort’s defenders were dead or wounded. The men, assuming they would be massacred the following day, broke into the Fort’s store of rum and got drunk. Things did not look good. Then came some hope. Around dusk, the French called out to discuss terms. The French demanded that Washington sign articles of surrender, return prisoners who had been captured at the Jumonville massacre, and agree to leave and stay out of the Ohio Valley for at least one year. Under these terms, the men would be free to leave with their possessions and arms, except for a couple of hostages to be held until the French prisoners were returned. Given the circumstances, this seemed rather generous. What was unclear about the terms, written in French as Washington was struggling to read at night and in the rain, was that they blamed Washington for the “assassination” of Jumonville and provided the French with a justification to declare war based on the young colonist’s actions. Washington signed the treaty and returned home. The Marquis Du Quesne had successfully removed all British from the Ohio Valley, established a French military presence down to the Ohio River, and forced the British to accept all blame for the conflict. With his goals achieved, he sought reassignment to a naval command. Washington was seen as a failure. Facing demotion, he resigned his commission. Having failed to accomplish any of the goals laid out by Britain or Virginia, and having been responsible for starting a war, the 22 year old Washington may have felt that military life perhaps was not for him. Next week: British officials in London send a force to clean up Washington’s mess in the Ohio Valley. * Artist renderings made long after the fact may not portray events accurately. Washington's expeditions (1753-1754) and Braddock's expedition (1755), by James Hadden, (1910). The History of Canada, Vol. 3, by William Kingsford, (1887). History of Cumberland, by William Harrison Lowdermilk (1878). Memoir Upon the Late War in North America, Between the French and English, 1755-60, by Pierre Pouchot, Vol. 1, & Vol. 2 (1866). A review of the military operations in North America: from the commencement of the French hostilities on the frontiers of Virginia in 1753, to the surrender of Oswego, on the 14th of August, 1756, by William Livingston, William Smith, and William Alexander, called Lord Stirling (1757) (This was written by contemporaries living in the colonies as the events transpired). Redcoats: The British Soldier and War in the Americas 1755-1763, by Stephen Brumwell (2002). Empires at War, by William M. Fowler, Jr. (2005).